This is a Christmas stocking for the cat. There is a mouse appliqued on the front. The word Nice is embroidered on the front. Turn the stocking over and the word Naughty is embroidered on the back. 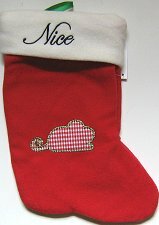 The stocking is 11" high x 7 1/2" wide. Made of 100% polyester fibers, handwash cold water. Green ribbon loop for hanging.